If you are planning a road trip to southern California, consider RV camping at Big Bear Lake. Big Bear Lake, located in the San Bernardino Mountains, is a unique mountain resort community 100 miles northeast of Los Angeles. There are 21,000 full time residents, with many more people visiting both summer and winter. Winter boasts snow activities such as skiing and snowboarding. Summer boasts water activities such as boating and fishing, along with hiking, and horseback riding. The lake is actually a man-made lake, which originated from the smaller Baldwin Lake at the east end of the valley. Big Bear Lake has 22 miles of shoreline. The name Big Bear Lake originated when Benjamin Davis Wilson and company rode into the valley and found it swarming with bears. The men divided into teams and went out and roped as many bears at they could and brought them back to camp. Story has it, that they had 11 bears roped and tied in camp at one time. There are three routes to travel when RV camping at Big Bear Lake. The fastest and easiest route to the take is Highway 330/18 through Running Springs. The downside to this route is the traffic is heavy on weekends and holidays. The second option for travel is Highway 38 through Redlands. This route takes a bit longer, but is the most scenic and has less traffic. Highway 18 through Lucerne Valley has less snowfall and is the best option during a winter storm. This route also has less mountain travel and may be the best when driving an RV. Check the road conditions before you travel to plan the route you will take. Sleeping in the beautiful pine forest in the comfort of your RV is one of the best ways to enjoy RV camping at Big Bear Lake. 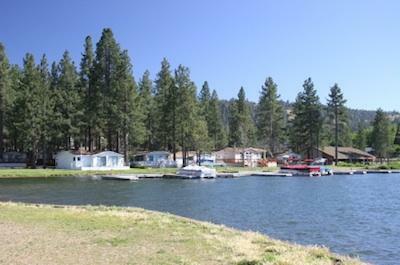 Big Bear has two main RV parks to choose from, and according to their official website, "Big Bear Lake has the perfect accommodations for you." The U.S. Forest Service operates the two campgrounds in the area. Bears are a common sight in Big Bear Lake. Store your food, beverages and toiletries in your car or a metal bear proof locker. When hiking, look for signs of bears and know how to react if you see one. Big Bear Lake has an online calendar of events so you can plan your trip around one of their annual activities.